Sidebar on Larry Tribe: I mentioned the eminence grise of Harvard Law School in the "Guns" portion of the previous Odds and ends. Frayfriend Persephone replied (scroll down to the fourth comment) with the lyrics to a parody song performed by the HLS Drama Society. On reading this, I was reminded of having seen something a couple of years ago about Tribe being accused of plagiarism (a subject about which another Harvard faculty member wrote this song). A little Google research showed that the Drama Society had retracted the song after Professor Tribe complained that it did not reflect the facts. Reading further in the Drama Society blog piece, I discovered a link to this web page, which I assumed to be another parody written by a clever student. I was flat-out amazed when further reading showed it was Tribe's own creation. It strikes me kind of like Rupert Holmes' execrable "Pina Colada Song" (more about that later) fortified with a shot of Arthur C. Clarke and a dash of Janet Evanovich. Particularly mind-boggling is his apparent conflation of an Edith Wharton protagonist with a Mansonette who wasn't involved in the Sharon Tate murders but later may have tried to assassinate President Ford. To paraphrase Horace, even Homer nods; still, this seems more like an episode of narcolepsy. Watch out, Wellfleet! College Point, Queens is breathing down your neck. Thanks to Tom of NYC Maritime for linking to Greg Beyer's Times piece about the Electric Oyster Experiment, in which scientists are trying, with apparent success, to create oyster beds in the East River (a misnomer; it's actually a tidal strait), where none have existed for many years. Their technique is to place metal racks in water and run an electric charge through them, which stimulates the growth of limestone on the metal. Seed oysters imported from Long Island Sound are then planted on the limestone, where they thrive. The racks are by Brooklyn sculptor Mara Haseltine, who makes them in the shape of DNA molecules. Good earworm of the day: "Driving the View," by Son Volt; hear it here. Anthemic chord progressions; inscrutable lyrics. What more couldja want? Bad earworm of the day: "Escape (the Pina Colada Song)," by Rupert Holmes. I was subjected to this on the car radio somewhere between Sturbridge and Hartford. If you're into masochism (not yoga), you can hear an especially cheesy instrumental version here. Be warned: I'm not responsible for any consequences. I've been neglecting other blogs as well as my own lately, so this announcement from Gary, of runs Brooklyn/Brooklyn runs came to me late and as quite a surprise. I had the pleasure of meeting Gary and his wife, Kate, at the Brooklyn Blogfest in May. I'll miss them both, and the fascinating entries and photos on Gary's blog, very much. I'm glad, though, that he's decided to leave the existing body of runs available on the net, so I'll keep my link to it, as well. There's much there worth going back and savoring. My closest friend in high school had a copy of Oscar Brand's Sports Car Songs, which had a "glossary" on the back of the sleeve. It defined "MGA" as "an abbreviation for meshugganah." Update: Lots of reaction to this post (note to self: cars a good topic). Goinglikesixty plumps for the MG TC. There was a time, when I was more into retro for retro's sake, when I would have agreed. 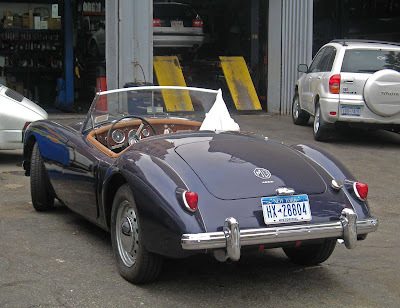 Now I prefer the minimalist, streamlined look of the MGA to the boxy, open fender aspect of the T series. Joe Martini agrees, though he prefers the Healey to the MG. Uh, Joe, unless you at some time drove a Chevy Vega, don't address the subject of combustible wiring harnesses. Karen Oh puts in a good word for the Morgan, a worthy mention indeed. I learn, to my delight, that Schad and I have something alike in our pasts - Sunbeam Alpines. Finally, Louise Crawford says a Healey was her family's car in the early 1960s. It must have been a very small family, and, at that, a very tight squeeze.